First, please be assured that we have purchased legitimate eclipse glasses from a source TSE17, not a third party vendor, recommended by the American Astronomical Society from a link on the NASA Eclipse viewing recommendations. They have been verified by an accredited testing laboratory to meet the ISO 12312-2 international safety standard for such products. Solar Eclipse Eye Safety, by B. Ralph Chou, BSc, MSc, OD, FAAO, Professor Emeritus, School of Optometry & Vision Science University of Waterloo, Ontario, Canada has some great information regarding safe viewing of the solar eclipse, as well as the American Academy of Ophthalmology. 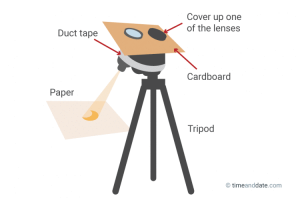 In addition to having eclipse glasses, we will have alternative viewing stations such as as Sun Funnel, which some students will be building tomorrow, as well as the binocular viewer shown to left. 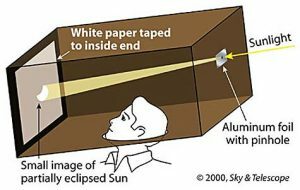 Students can easily build a pinhole viewer like the one on the below as well. Here are some other ways to view the eclipse by Exploratorium. We hope to have a very memorable day where the students experience an amazing celestial phenomena. Previous Previous post: Keyeion went to Costa Rica!